Unlike common belief, this Bharata is the son of King Rshabhadeva, a partial avatara of Lord Vishnu. But in the Mahabharata, the whole of Bharata race, and by extension, the country, is named after the son of Dushyanta and Shakuntala, who was also called by the same name. So, my question is, what role does Shakuntala's son have in naming India as Bharatavarsha, if it was already named so? And if it was rechristened as "Bharatavarsha" twice, what was the name between the first and second Bharatas? From Puru was descended King Bharata after whom the land came to be known as Bharatavarsha. Also in this line was King Kuru, after whom all the descendants came to be known as Kauravas. The sacred place named Kurukshetra owes its name to King Kuru. This is for the king Bharata from 1st Manvantara and not for Shakuntala's son Bharata. Then why it was renamed? Point of view 1: It was not renamed actually just those verses are said in praise of the Chakravarati king (Shakuntala's son Bharata) who ruled the entire country. It is also believed that King Bharata (younger brother of Rama) also ruled the entire country (for 14 years). Thats what Lord Shri Rama himself says in Kishkindha Kanda, Valmiki Ramayana. 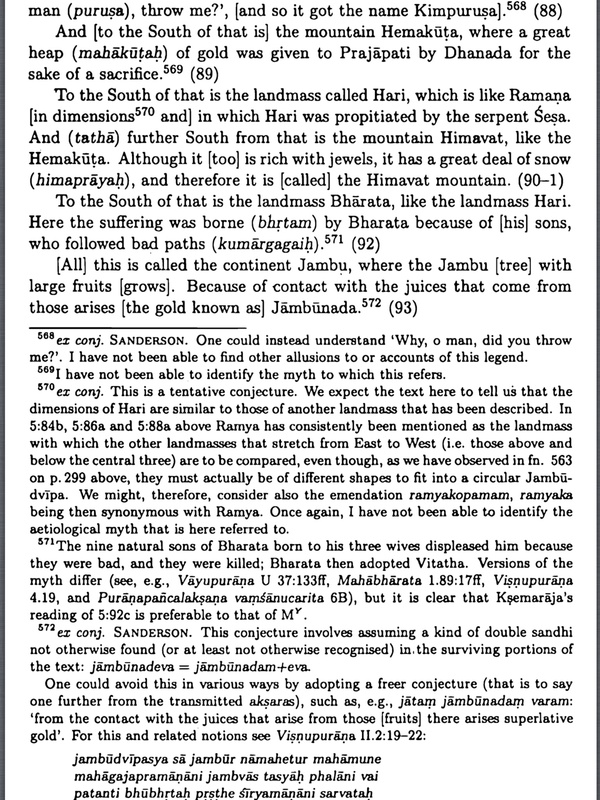 Point of view 2: There is a Deluge (Jal pralaya) believed in the beginning of current (7th) Manvantra, as described here. And in 7th Manvantra, we don't find any other Chakravarti Samrat named Bharat other that two: Lord Shri Rama's brother and Shakuntala's son. So few scriptures say that our country named as Bharata after them. But if we consider the Kalpa theory which says that complete annihilation happens after each Kalpa and not after Manvantra. In the beginning of 7th Manvantra was partial pralaya, I mean no reference found for the fresh creation as in the beginning of Kalpa. So Earth was there, the region on which Bharata ruled (Bharata Varsha) was also there. So point of view 1 seems more appropriate. Not the answer you're looking for? Browse other questions tagged mythology mahabharata history bhagavata-purana chandravansh . Why India's name is “Bharatvarsha” according to Linga Purana? Why did Krishna have to be the eighth son? Dhritarashtra's role and the way he died in the Mahabharata?